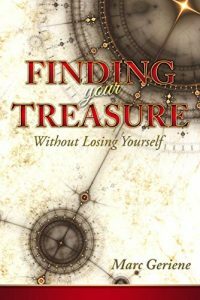 With Finding Your Treasure, Geriene shares many of his adventures and teaches you how to identify your treasure—your principal pursuit and how to set a course for the adventures and treasures you seek with a proven 10-step plan and five daily exercises for success in any endeavor. Marc is an inventor, entrepreneur, treasure diver, and remotely operated vehicle (ROV) pilot with 40+ years project experience, primarily in the marine industry. He and his brother Krist have been active participants and managed shipwreck and treasure projects in Asia, the Caribbean, Gulf of Mexico, South America and the United States. As a co-inventor of the Nova Ray ROV, he shares credit with his business partner and brother Krist for acquiring ten US and International patents for ROV’s. In 2008, Marc was responsible for generating a 3-year, multi-million dollar Nova Ray technology transfer and Joint Venture with PETRONAS, the National Oil Company of Malaysia. Marc and his wife balance their lives between their two homes in Seattle and the Philippines.